This article first appeared in The Edge Financial Daily, on May 7, 2018. KUALA LUMPUR: Datasonic Group Bhd expects its net profit to surpass the RM100 million mark for the first time in its financial year 2019 (FY19) ending March 31, 2019, driven by growth across all its business segments. Its managing director Datuk Abu Hanifah Noordin said once the level is broken, he expects the group’s net profit to stay above RM100 million from thereon. His confidence is on the back of Datasonic securing new contracts. Abu Hanifah believes the potential to expand its smart ID and e-Passport project both in Malaysia and overseas is huge. This year, the group has set its sights on penetrating new foreign markets as part of its aim to be a leading security-related solutions provider in the region by 2020 and in the global market by 2025. “We are looking out of Malaysia for future growth,” he said in an interview with The Edge Financial Daily. “We have been receiving a lot of inquiries from neighbouring countries, particularly about our passport products,” said Abu Hanifah, adding that countries in Africa and the Middle East have also expressed interest in its products. 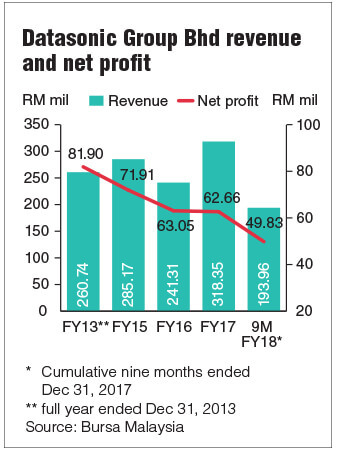 For the cumulative nine months ended Dec 31, 2017 (9MFY18), the group’s net profit rose 11.5% year-on-year (y-o-y) to RM49.83 million, despite a 14.1% y-o-y drop in revenue to RM193.96 million owing to lesser supply of smart cards and personalisation services. Abu Hanifah said the group expects its performance for the full FY18 to be better than FY17, on higher revenue contribution from the supply of passport booklets and effective cost control measures. The last time Datasonic pulled in record earnings was in FY13 ended Dec 31, 2013 when it posted a net profit of RM81.9 million. The group changed its financial year end to March 31 in FY14. The group saw a slight dip in net profit to RM62.66 million in FY17, compared with RM63.05 million in FY16, due mainly to higher direct costs for new projects undertaken in FY17. Revenue, however, was up 31.9% to RM318.35 million from RM241.31 million. On its joint venture (JV) with Tanzania-based telecommunications equipment firm Global Agency Ltd (GAL), Abu Hanifah said the group is still awaiting final approval to proceed with the border control-related security project, which it hopes to receive by the end of this year. Under the JV, Datasonic will be offering its expertise in e-Gate and e-Visa systems. In 2016, the group announced that it was buying a 67% stake in GAL. It was previously reported that Datasonic, through GAL, would be securing a US$192 million contract from the Tanzanian government, and once materialised, the deal would contribute up to RM15 million per year to Datasonic’s bottom line over eight to 10 years. “We have to identify good partners who have the same passion as us. As such, we have to be very careful and selective in choosing our partners,” Abu Hanifah said, adding that the group is also eyeing national ID and polycarbonate data page passport projects in other African countries, besides Tanzania. Meanwhile, Datasonic has been conducting a lot of research and development to create the latest generation of e-Gate system in Malaysian airports, as well as other innovative products. “We have built the next-generation e-Gate, which cuts the time [for passengers passing through the gate] by almost half to less than seven seconds. We have patented it for nine months locally and will patent it internationally. This technology is the first in the world,” said Abu Hanifah, noting that the e-Gate system has received positive responses from other countries. The new e-Gate system will no longer use fingerprint scanning, but will feature facial recognition technology instead. It will have two cameras; one of which will first identify the passengers before entering the auto-gate while waiting in line, and the second camera will reidentify the passengers upon passing through the auto-gate. Besides the auto-gate, Datasonic has been exploring other potential areas to drive growth such as chip-based driving licences and electronic driving licences. Datasonic is investing up to RM25 million in capital expenditure (capex) for FY19, of which RM16.8 million will be used to buy buildings and another RM8 million for machinery. Abu Hanifah said the capex will be funded via a combination of both internal funds and bank borrowings. Datasonic currently produces 3.3 million MyKad cards per year and has the capacity to produce up to six million MyKad cards per year out of its two manufacturing plants. Earlier last month, it acquired a factory in Klang, Selangor for RM18.88 million. With this newly acquired factory, Datasonic expects its production capacity to increase to 10 million cards per year. “The factory is expected to commence operation in the first half of 2019 and will be catering for both local and overseas demand,” said Abu Hanifah. Datasonic’s order book currently stands at RM957.5 million. Shares in Datasonic closed unchanged at 91 sen last Friday, with a market capitalisation of RM1.23 billion. The stock has fallen 30.4% from its one-year peak of RM1.31. Abu Hanifah believes that Datasonic’s share price does not reflect its true value, as the share price has been trending downwards even though the group has been growing steadily.